Crawford informed the Observer’s readers that he had just ‘returned from walking, with another archaeologist, along the whole length of the Avenue (Fig. 3). We could not see the faintest trace on the surface until we had got a mile beyond West Amesbury’ (i.e. they began at the Avon, moving from the unknown to the known) (Crawford 1923a). 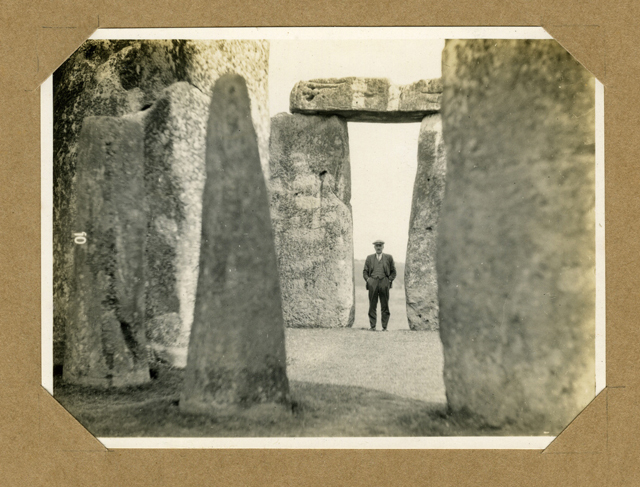 His companion on the walk was not named in the newspaper article, but according to Colonel Hawley’s Stonehenge excavation diaries (typescript copy in Salisbury and South Wiltshire Museum) it was Wiltshire-based archaeologist R.S. Newall, their stroll occurring on 19th July8. 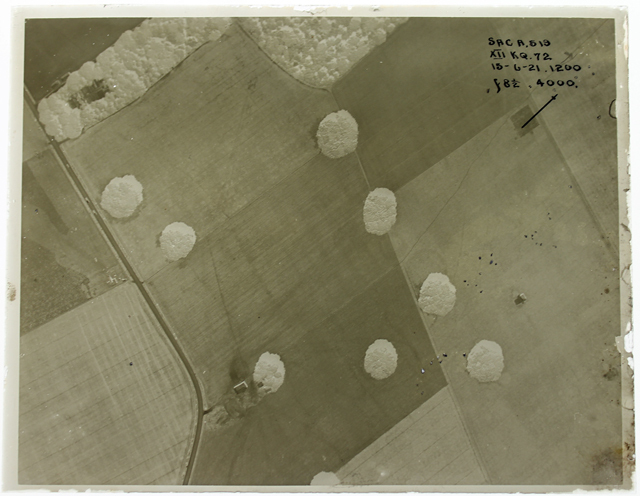 In his first Observer article, Crawford claimed to ‘feel quite certain that the marks on the air-photos are those of the Avenue banks, but I do not expect others to be convinced until trenches have been dug across to prove it’ (Crawford 1923a). 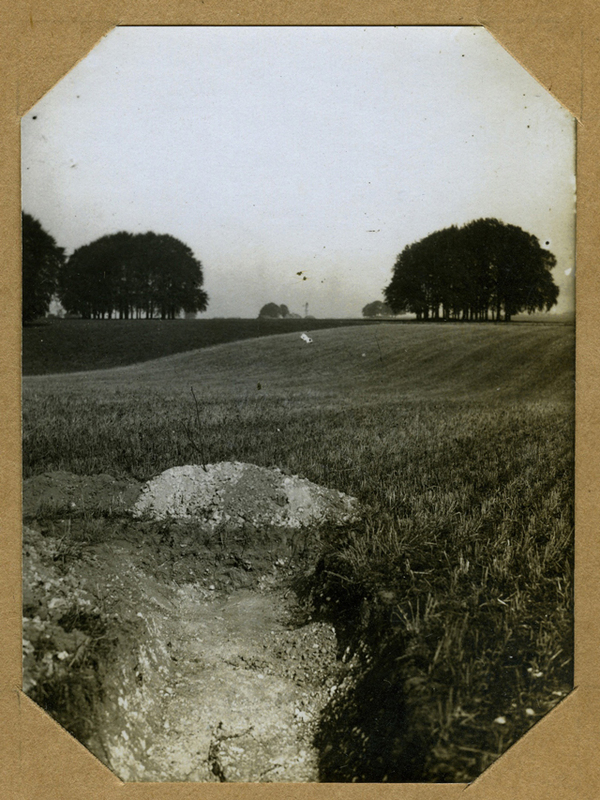 That digging began on 5th September 1923. 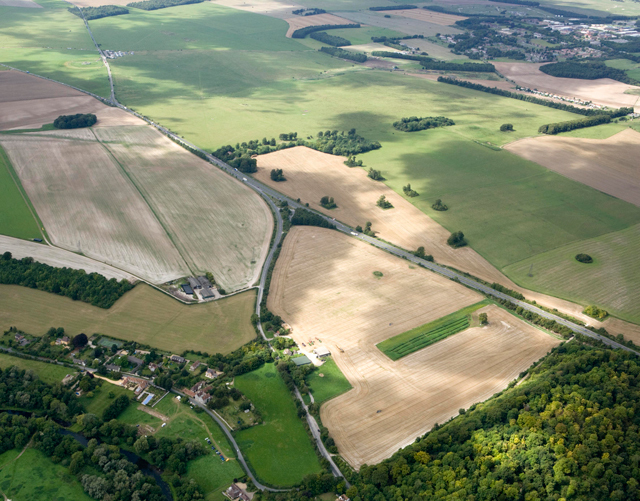 This time, Crawford was assisted not by Newall but by another Wiltshire-based archaeologist, A.D. Passmore, along with an unspecified number of unidentified labourers. ‘We were fortunate… in the choice of diggers’, he noted, ‘a most important consideration when so much depended upon a knowledge of the soil and upon the ability to detect signs of previous disturbance’ (Crawford 1923c). 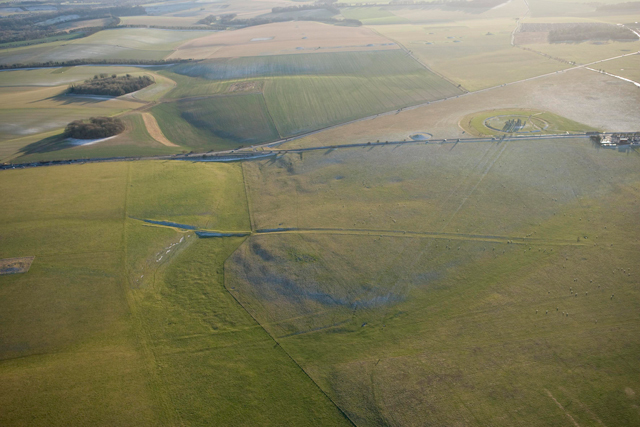 The results were again presented first to the readers of the Observer in an article published on 23rd September, an article that began with the claim that ‘The missing branch of the Stonehenge Avenue… has now been proved conclusively by means of excavation’ (ibid.). 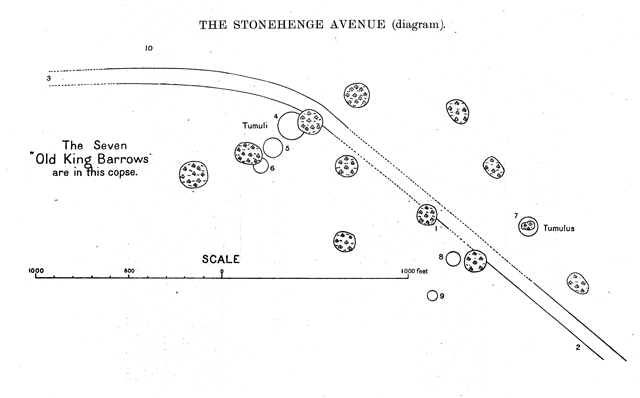 After the Observer article trumpeting the success of the excavations, Crawford only published two more very brief accounts of the work – one in the Antiquaries Journal (Crawford 1924a), the other in his Ordnance Survey monograph Air Survey and Archaeology (Crawford 1924b), these offering little additional detail, along with only the sketchiest indication of where the trenches had been dug (Fig. 6). Nothing more detailed ever appeared. Sir Arthur Conan Doyle regarded The Gate of Remembrance as ‘one of five particularly convincing works’ which he urged sceptics to read (McCabe 1920: 140), although it is not clear that Conan Doyle had fully grasped Bligh Bond’s explanation of his ‘psychological experiment’ – referring to Bligh Bond’s book, he noted that ‘in automatic writing you are at one end of the telephone… and you have no assurance as to who is at the other end’ (Doyle 1919, 46). In fact, Bligh Bond was quite clear where he thought the calls were coming from, and recognised that often he himself was at both ends of the line. Bligh Bond saw the contents of the scripts as representing a blending of the workings of the subconscious minds of those involved – a combination of himself and co-automatist ‘John Alleyne’19, following their extensive and detailed study of all available documents and records relating to the history of the Abbey, and a more universal subconscious – a ‘reservoir of cosmic memory’ – comprising the collected memories and personalities of the dead (Bligh Bond 1918; 1919). As one automatic script put it, ‘ye past dyeth but not slepeth, nay ffor perchaunce hit wakyth and hit ys they of ye present who doe slepe and dreme’ (Bligh Bond 1918, 21). As Bligh Bond explained to readers of The Times (8th December 1919, p. 11), ‘There is very fruitful study for us all in this psychological business’. In his book Creating Prehistory, Adam Stout (2008) examined the processes that saw British archaeology, and particularly prehistory, become increasingly professionalised and institutionalised during the early- to mid 20th century, processes that included the establishment of disciplinary boundaries, of professional norms, standards, values and, of course, methods: ‘distinguishing the scientific approach from the romantic was an absolute necessity for those who sought to establish archaeology as a profession’ (ibid., 165). Crawford’s role in this was considered ‘pivotal’ (ibid., 20), his book Man and his Past ‘a manifesto, a rallying cry for a new generation of archaeologists who shared in the idealism and the faith in the potential of progress’ (ibid., 21), that new generation (or ‘heroic band’) including the likes of Gordon Childe, Stuart Piggott, Grahame Clark and Christopher Hawkes, among others. The problem of course is recognising where the boundaries between scientific and romantic approaches lay, and the relationship between boundaries adhered to in public and those in place in private, among one’s friends, colleagues, and peers (see Wickstead this volume). His Aunt Edith was part of the Anglican Community of St Mary the Virgin, which ran Spelthorne St Mary, Feltham, an institution established ‘to give an opportunity of reformation to women anxious to overcome a habit they are unable to control’ (Elizabeth 1974: 177), the ‘habit’ generally involving alcohol or drugs. Crawford later wrote of Edith that ‘she believed in ghosts’ and claimed to have had one successfully exorcised26. On 17th June 1900, in a letter which he asked her to tear up once she had read it, Crawford told Edith that ‘I have, but it need not trouble you, as it is only occasional and slight, been rather laughed at for believing in ‘ghosts’; I do not mean such silly things as are put in magazines, ‘she saw a white figure advancing’ etc etc & such like trash – but in your ghosts. I think from your experiences that you do believe in them… I think too, although it may be absurd, that there are ghosts all over the place, only not visible – why some are permitted to be seen I do not know…’27. Lankester’s letter to The Times, in which he detailed how Slade’s fraudulent production of automatic writing had been uncovered40, appeared on the newspaper’s letters page on the same day as Lane Fox’s explanation of his domestic experiments with automatic writing, and was placed immediately before it. In it, Lankester used this exposure of fraud to support his criticism of the decision to allow Barrett to speak at Glasgow, arguing that ‘the discussions of the British Association have been degraded by the introduction of the subject of spiritualism, and the public has learnt – perhaps it is time they should – that ‘men of science’ are not exempt as a body from the astounding credulity which prevails in this country and in America. It is, therefore, incumbent upon those who consider such credulity deplorable to do all in their power to arrest its development’ (The Times, 16th September 1876, p. 7). 32A version of the paper was eventually published in the first volume of the SPR’s Journal (Barrett 1882), although the Spiritualist was one of a number of magazines that promptly printed the text apparently as given (vol 9, no 8, 22nd September 1876, pp. 85–88). Crawford, O G S (1912a). The Distribution of Early Bronze Age Settlements in Britain. Geographical Journal 40(2): 194–203, DOI: https://doi.org/10.2307/1778466 Available at: http://www.jstor.org/stable/1778466. Crawford, O G S (1912b). The Distribution of Early Bronze Age Settlements in Britain (continued). Geographical Journal 40(3): 304–317, DOI: https://doi.org/10.2307/1778948 Available at: http://www.jstor.org/stable/1778948.